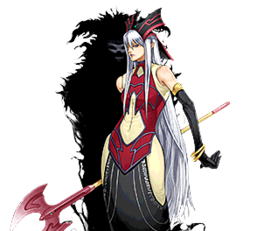 "Ruin, Queen of Oblivion" and the shadow of "Demise, King of Armageddon"
Demise and Ruin are two line-ups of Ritual Monsters (one of DARK Fiends and the other of female LIGHT Fairies), originally debutting in Shadow of Infinity and much later expanded in Cybernetic Horizon. The original three cards of the theme were unique in that they consisted of the first Ritual Spell Card to specifically list two separate Ritual Monsters. Demise appears in Yu-Gi-Oh! GX as a character, and both Demise and Ruin appears as characters in some video-games. The Two Gods Repeating the Cycle of the World's Destruction! "Demise", the one who destroys the world with all his might, and "Ruin", the one who brings about gentle destruction so that there may be rebirth. Their existences are two sides of the same coin – the moment one has finished their goal, the other appears to take their place, continuing the eternal cycle of the world's destruction. This page was last edited on 29 November 2018, at 03:14.